In this article I will bring together several techniques for troubleshooting a performance- and security-related “phenomenon” I recently noticed when doing some tests with Natively Compiled Stored Procedures. In SQL Server 2014, Natively Compiled Stored Procedures did not support EXECUTE AS CALLER but EXECUTE AS “SpecificUser” was required. This user could be specified with “Username”, “Self” or simply “Owner” – in which case the owner of the procedure usually reverts to the schema owner, which mostly reverts to the Database Owner altogether. Hintergrund: In SQL Server 2014 unterstützten Natively Compiled Stored Procedures EXECUTE AS CALLER nicht, sondern es war EXECUTE AS “SpecificUser” erforderlich. Dieser Nutzer konnte mit “Username”, “Self” oder einfach “Owner” spezifiziert werden – in dem Fall kehrt der Besitzer der Prozedurnormalerweise zum „schema owner“ zurück, was meistens ganz auf den Database Owner zurückkehrt. The phenomenon I encountered was that I noticed some pretty strange long execution times when running a workload consisting of a very basic stored procedure that does nothing more than insert one row of data into a small, unspectacular table. The insert itself should run in less than a second for 1000 rows, but I could see up to 5 seconds. Das Phänomen, dem ich begegnete, war, dass ich einige ziemlich seltsam lange Ausführungszeiten bemerkte, als ich eine Workload laufen ließ, die aus einer sehr einfachen Stored Procedure bestand, die nichts weiter tat, als eine Datenreihe in eine kleine, unspektakuläre Tabelle einzufügen. Das Insert selbst sollte weniger als eine Sekunde für 1000 Zeilen laufen, doch ich konnte bis zu 5 Sekunden sehen. From this list, Latch-contention, blocking and some waiting for IO is to be expected with a very concurrent workload (50 threads trying to insert on the last page). The wait-types marked red are the ones that caught my attention. As Preemptive waits are a quite different beast, and I initially thought maybe there was some authentication issue with the client, I decided to take a look at the CMEMTHREAD. Von dieser Liste sind Latch-contention, Blocking und einiges Warten auf IO bei einer sehr simultanen Workload zu erwarten (50 Threads, die versuchen, sich auf der letzten Page einzufügen). Die rot-markierten Wait-Typen sind diejenigen, auf die ich aufmerksam wurde. Da Preemptive Waits ein spezielles Biest sind, und ich anfangs dachte, dass es vielleicht ein Authentifikationsproblem beim Client gab, entschied ich mich, einen Blick auf den CMEMTHREAD zu werfen. The CMEMTHREAD is an indicator that many threads are contending simultaneously for a thread-safe memory object. So, the question is, which memory object is so special here. Der CMEMTHREAD ist ein Indikator dafür, dass viele Threads gleichzeitig um ein thread-safe Memory-Object konkurrieren. Also ist die Frage, welches Memory-Object hier so besonders ist. 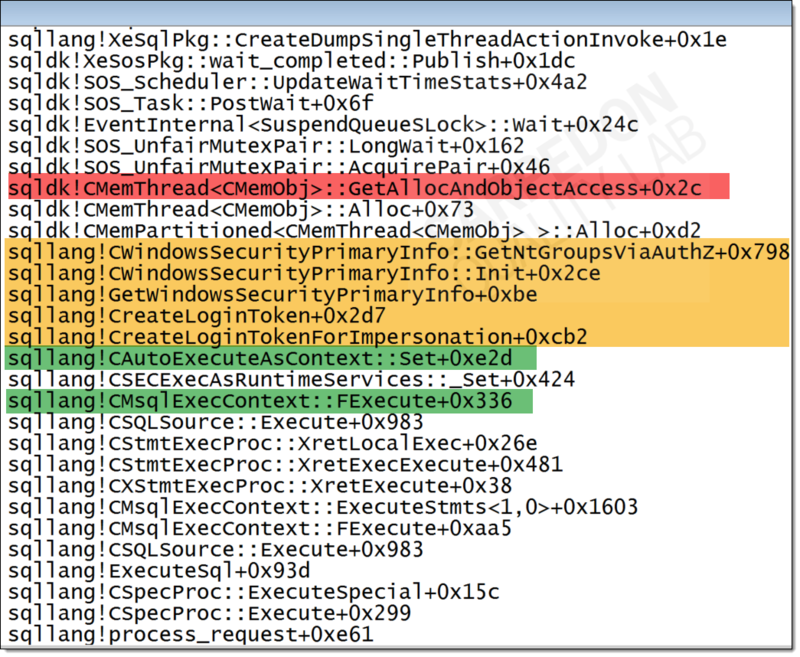 One of the niftiest features of extended events is, that you can get a full stack dump of just a single thread, using the Action “sqlserver.create_dump_single_thread”. ”. Similarly, using “package0.callstack” you can get a callstack of the last 16 frames. Eine der raffiniertesten Features von Extended Events ist, dass man einen vollständigen Stack Dump von einem einzelnen Pfad erhalten kann, wenn man die Action “sqlserver.create_dump_single_thread” verwendet. Auf ähnliche Weise kann man einen Callstack der letzten 16 Frames erhalten, wenn man “package0.callstack” verwendet. And those in turn must have been caused by the sqllang!CAutoExecuteAsContext::Set, sqllang!CMsqlExecContext::FExecute and so on (green). Und diese wiederum müssen von sqllang!CAutoExecuteAsContext::Set, sqllang!CMsqlExecContext::FExecute verursacht worden sein, und so weiter (grün). The here unreadable callstack for the call to AUTHORIZATIONOPS (undocumented) on the bottom. Der hier unlesbare Callstack für den Call AUTHORIZATIONOPS (undokumentiert) unten. 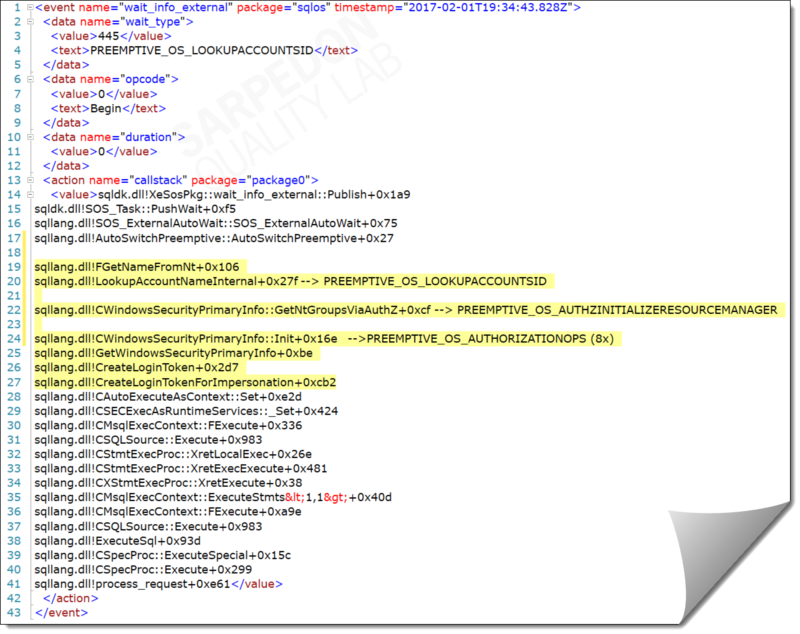 From those calls one can deduct that not the client is authenticating at SQL Server, but actually the procedure call itself causes Windows API calls (LOOKUPACCOUNTSID, AUTHZINITIALIZERESOURCEMANAGER) for authentication purposes. Now at the very latest it’s time to check the ownership-chain for the stored procedure. So I checked the header of the proc, and indeed, just as I expected it contained a “WITH EXECUTE AS OWNER”. That alone can’t be it, so the question is, who is the owner. I already suspected it and there it was: The database was owned by a LOCAL Windows account. Now, that is rare, but it all makes sense now: For every execution of the procedure, the ownership had to be verified – and since it is a Windows-Account, it had to go out of SQL Server OS, using a Preemptive call to Windows, wait, and continue only after Windows returns control of this thread back to SQL Server. Aus diesen Call lässt sich ableiten, dass es nicht der Client ist, der sich bei SQL Server authentifiziert, sondern dass es tatsächlich der Procedure Call selbst ist, der Windows API Calls (LOOKUPACCOUNTSID, AUTHZINITIALIZERESOURCEMANAGER) für Authentifizierungszwecke verursacht. Spätestens jetzt ist es an der Zeit, die Besitzerkette für die Stored Procedure zu überprüfen. Also habe ich den Kopf der Prozedur geprüft, und tatsächlich, genau wie ich erwartet hatte, enthielt es ein “WITH EXECUTE AS OWNER”. Das allein kann es nicht sein, also stellt sich die Frage, wer der Owner ist. Ich vermutete es bereits, und da war es: Die Datenbank gehörte zu einem LOKALEN Windows-Konto. Nun, das ist eher selten, doch jetzt ergibt alles Sinn: Für jede Ausführung der Prozedur musste der Besitz verifiziert werden – und da es ein Windows-Konto ist, musste es raus aus SQL Server OS gehen, indem ein Preemptive Call an Windows verwendet wird, dann warten, und erst dann weitermachen, nachdem Windows die Kontrolle dieses Pfades an SQL Server zurückgegeben hatte. - I did also test with Admin vs. non-Admin and NTLM vs. Kerberos but saw no difference. - Ich testete auch mit Admin vs. non-Admin und NTLM vs. Kerberos, stellte jedoch keinen Unterschied fest. 2) Using a Domain Account I could notice that every 10 minutes the next execution would be a bit slower. Beim Verwenden eines Domain-Kontos konnte ich sehen, dass die nächste Ausführung alle 10 Minuten etwas langsamer war. And exactly every 10 minutes I saw some additional KERBEROS-traffic going to the Domain Controller. 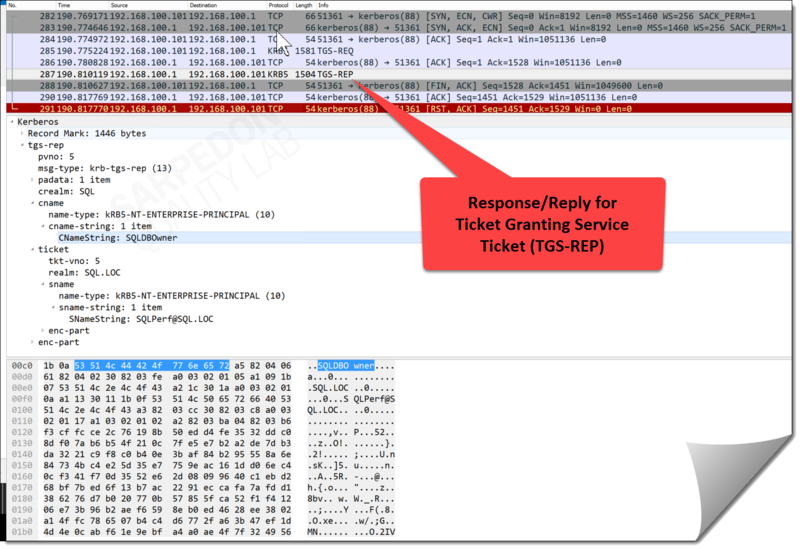 Below you see the opened data frame with the Request for a Ticket Granting Service Ticket (TGS-REQ). Um den Unterschied zu erklären, führte ich ein Network Trace mit Wireshark aus. Und genau alle 10 Minuten sah ich einigen zusätzlichen KERBEROS-Traffic zum Domain Controller fließen. Unten seht ihr den geöffneten Datenrahmen mit dem Request for a Ticket Granting Service Ticket (TGS-REQ). As the User, on whose behalf the service requests the service ticket, is identified using the user name and user realm/domain (SQL\SQLDBOwner in my case), the padata type PA-FOR-USER is used, as you can see in the screenshot. You can even see the Checksum added for protection. The S4U2self extension of the PA-DATA structure allows a service to obtain a service ticket to itself on behalf of a user. The user is identified to the KDC using the user's name and realm. Wenn der Nutzer, für den der Service das Service-Ticket anfordert, unter Verwendung des Nutzernamens und user realm/Domäne (SQL\SQLDBOwner in meinem Fall) identifiziert wird, wird der Padata Type PA-FOR-USER verwendet, wie im Screenshot zu sehen. Man kann sogar die Checksum sehen, die zum Schutz hinzugefügt wurde. Die S4U2self Extension der PA-DATA-Struktur erlaubt einem Service, ein Service-Ticket im Auftrag eines Nutzers für sich selbst zu beziehen. Der Nutzer wird gegenüber dem KCD identifiziert, unter Verwendung des Nutzernamen und Realm. 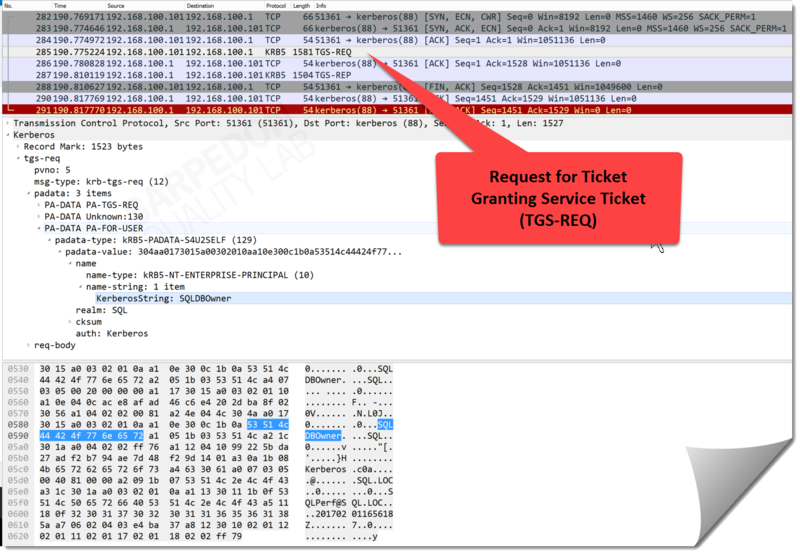 1) After doing some extensive testing, I conclude that the 10-minute interval after which a new Ticket Granting Service Ticket-Request is initiated must be a SQL Server specific enhancement for Domain Accounts to avoid making this round trip for every SID-validation. The 10 minutes are consistent and independent from other workload influencers. The cause behind is not documented. 3) For the local Windows Account, there is no such performance improvement via caching which results in much slower response times. Nach ausgiebigem Testen schließe ich, dass das 10-Minuten-Intervall, nach dem ein neuer Ticket Granting Service Ticket Request eingeleitet wird, eine SQL-Server-spezifische Erweiterung für Domain-Accounts sein muss, um diese Rundreise nicht für jede SID-Validierung machen zu müssen. Die 10 Minuten sind konsistent und unabhängig von anderen Workload-Beeinflussern. Die Ursache dahinter ist nicht dokumentiert. Für das lokale Windows-Konto gibt es keine solche Performance-Verbesserung via Caching, was zu viel längeren Antwortzeiten führt. 1) Using local users for SQL Server can create noticeable impact for short transactions. Yet another reason to stay away from local accounts. 2) For the SQL Account, naturally no Windows calls are necessary at all, but the performance-advantage compared to the AD-Account is marginal, even for high-speed scenarios. 3) Network latency matters even between SQL Server and DC. Not just for the initial Login-phase but even for ongoing validations from within SQL-statements. Die Verwendung von lokalen Nutzern für SQL Server kann deutliche Auswirkungen für kurze Transaktionen verursachen. Noch ein weiterer Grund dafür, sich von lokalen Konten fernzuhalten. Für den SQL Account sind natürlich keine Windows-Calls notwendig, doch der Performance-Vorteil gegenüber dem AD-Account ist geringfügig, selbst für High-Speed-Scenarien. Netzwerk-Latenz spielt selbst zwischen SQL Server und DC eine Rolle. Nicht nur für die anfängliche Login-Phase, sondern sogar für fortlaufende Validierungen innerhalb von SQL-Statements. I hope you found this an interesting read. Ich hoffe, dies war eine interessante Lektüre für euch. I have been invited to speak at THE SQL Server Conference in the Middle East: at SQL Gulf 3 taking place in Riyadh, Saudi Arabia on April 23rd. I feel very much honored to be among the selected speakers: Denny Cherry, Victor Isakov, Peter Myers, Satya Shyam K and Shehap El-Nagar the organizer himself, who has done a great job pulling this off the third time! For example about 7 TV stations are expected to cover this event! Ich bin eingeladen worden auf DER SQL Server Konferenz im Nahen Osten: auf der SQL Gulf 3, die am 23. April in Riad Saudi Arabien stattfindet, als Sprecher aufzutreten. Ich fühle mich sehr geehrt unter den ausgewählten Sprechern zu sein: Denny Cherry, Victor Isakov, Peter Myers, Satya Shyam K und Shehap El-Nagar dem Organisator selbst, der einen tollen Job gemacht hat, das zum dritten Mal zu leisten. So werden zum Beispiel ca. 7 TV-Sender werden von diesem Event berichten! For SQL Server 2014 a completely new In-Memory Engine for memory optimized table & indexes was integrated into SQL Server with in fact very limited functionality. For SQL Server 2016 the In-Memory engine is being extensively improved in terms of both scalability and T-SQL language support. Moreover, the ColumnStore index technology has been improved and can now even be combined with memory-optimized tables. In this session I will provide an overview of the new possibilities and demonstrate where a particular technology may help – or where you cannot expect benefits. If you are planning to go on SQL Server 2016 any time soon, this session shows you two of the most important features that SQL Server 2016 brings. In this session I will give insights into the most important security features of SQL Server 2016. In fact, this release will introduce completely new features that serve data security on different levels. The top 3 features are: Dynamic Data Masking, Row Level Security, and, as a highlight: Always Encrypted. Also, the new possibilities in Azure will not remain unmentioned either. The session will provide technical insights and demos but also hints to security traps. In the end a system is only as secure as its weakest spot. This session aims to assist Administrators as well as Developers in determining the right technologies for their needs. I am looking forward to making many new contacts with people from this region of the world that is striving for modernization in many aspects and already reached the top in several. Ich freue mich darauf, viele neue Kontakte mit Menschen aus dieser Region, die in vielerlei Hinsicht nach Modernisierung strebt und in einigen bereits Spitzenklasse erreicht hat, zu machen. After the great success of the German SQLKonferenz in February, where I had the honor of presenting the new security features of SQL Server 2016 together with Joachim Hammer, the Program Manager of the security teams of the relational SQL Engines at Microsoft in Redmond (more info), I finally found time to go about the next big conferences this year. Für den PASS Summit 2016, der wieder in Seattle/USA stattfindet, und auch für den SQLServerGeeks Annual Summit 2016, der in Bangalore/Indien stattfindet habe ich insgesamt 6 Sessions aus den Themengebieten „Sicherheit“, „Performance Analyse“ und „In-Memory“ ausgearbeitet und eingereicht. Dazu kommen 2 ganztägige PreCons zum Thema „Sicherheit“ und „In-Memory“. Wen es interessiert, zu sehen, was ich diesmal „in Petto“ habe, kann die Abstracts hier einsehen. For whoever is interested to see what I have “up my sleeve” this time, can review the abstracts here. Security Hardening is a subject which, sooner or later, every DBA will face. Microsoft SQL Server, according to the NIST vulnerability database the most secure RDBMS for years, contains many features that help keep the data secure on different layers. At the same time, ever-new applications which use databases on your servers, support-personnel, deployment-processes, auditors, and other processes and real people are constantly demanding access to your Server. At this full-day pre-conference you will see how external and internal attackers can gain access to sensitive data. You will then learn how to secure the different attack surfaces of a typical SQL Server, and protect not only Data at Rest but also Data in Use and Data in Transit and learn best practices to prevent common vulnerabilities. and you will learn how to use built-in functionalities of SQL Server (some limited to v2016) to build your own security frameworks to secure Deployment and Monitoring, separate Job-permissions; how to implement time-based permissions and which techniques can help reconstruct security-relevant events. If you are in charge of creating or implementing security concepts or need a full picture of attack surface protection and concepts, this session is exactly right for you. The Columnstore Index technology came with SQL Server 2012 in the form of Nonclustered Columnstore, and SQL Server 2014 brought us updatable Clustered Columnstore Indexes and a completely new In-Memory Engine for memory optimized table & indexes. SQL Server 2016 is adding the updatable Nonclustered Columnstore Indexes that can both operate on row store as well as on memory-optimized tables, called In-Memory Operational Analytics. With the In-Memory engine being extensively improved in terms of both scalability and T-SQL language support, In-Memory will become a viable option in many projects. On this training day, attendees will be given a complete picture on the current state of technology and how and where to use either In-Memory OLTP or ColumnStore or both for efficient queries and data store. 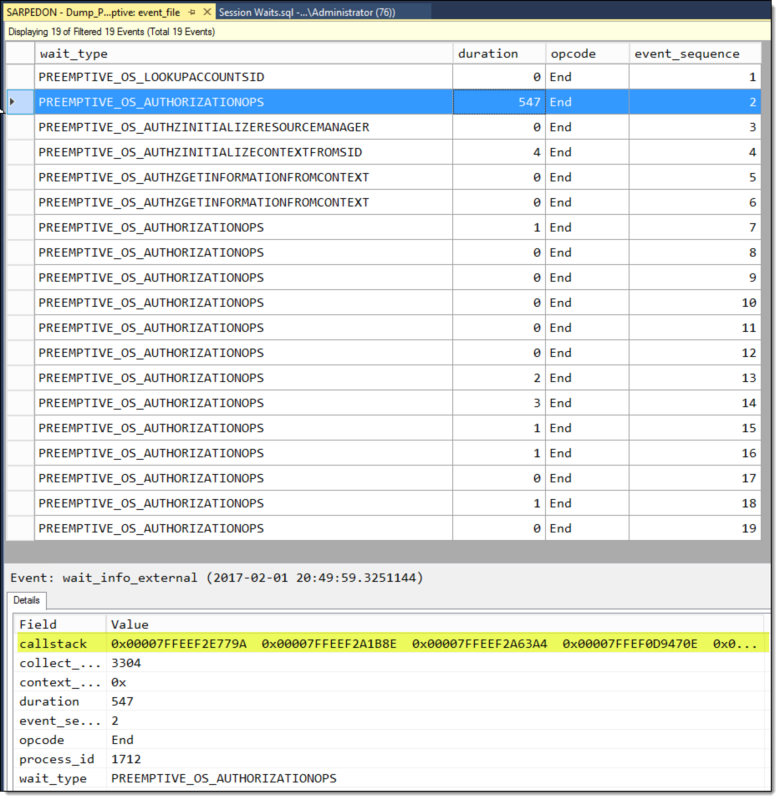 Extended Events, which entered the product in SQL Server 2008, are replacing the old SQL Trace & Profiler - and there are many good reasons for that. In this session you will see a selection of the most fascinating possibilities using this Tracing Framework. If you want to find out how to trace in a flexible and lightweight way, how to do advanced analysis directly inside the GUI, how to audit Database and Table-access without Auditing, how to analyze deadlocks without old-fashioned TraceFlags based on the built-in system_health session, this session is just for you. You will also learn how to use the GUI in an effective way for top-down-analysis and what is possible with some XQuery scripting. This session you will be lead you through an example performance-analysis using mainly DMVs and Extended Events. You will see how a top-down analysis using built-in tools can be conducted. This will include wait statistics on different scopes to identify performance problems and bottlenecks up to identifying query plan changes – with & without using the Query Store of SQL Server 2016. If you are new to performance analyzing this session will give you a practical insight into how to methodically approach performance troubleshooting. For SQL Server 2016 the In-Memory engine is being extensively improved in terms of both scalability as well as T-SQL language support. Moreover the ColumnStore index technology has been improved and can now even be combined with memory-optimized tables. This session will provide an overview of the new possibilities and demonstrate where a particular technology may help – or where you cannot expect benefits. If you are planning to go on SQL Server 2016 any time soon, this session shows you two of the most important features that SQL Server 2016 brings. You have installed SQL Server and have heard about several “best practices,” maybe renamed the sa account, but now what? In this session you will see demos of several methods how an attacker can get access to data in Use & in Transit and see which available built-in technologies provide help in mitigating such attacks. You will be given guidance on how to systematically identify possible threats and ne given best practices at hand. Among the technologies that can be seen are Network sniffing, a Threat Modeling Tool, TDE and the new Always Encrypted technology of SQL Server 2016. This session is mainly targeting Administrators but many concepts and samples should be valuable knowledge for developers as well. You got SQL Server up and running and thought you could easily secure it by completely denying all access to everybody else except you and your co-admin, but you realize that there are many more individuals demanding access for daily or weekly operations. You have heard about “Segregation of Duties” and “Least Privilege” and are looking into how you can properly implement it with SQL Server. In this session you will learn about techniques and approaches on how to implement secure processes in order to ensure both “Least Privilege” and “Segregation of Duties” and at the same time “Reconstruction of Events.” Among the techniques shown are “time based-permissions” and custom server roles for performance analysis and job-monitoring. One of the most frequently attacked targets is the data that resides in a database server. SQL Server is considered “secure by default,” but this is only relevant until the first databases and configurations have been changed. This is why most of the exploited weaknesses are due to misconfiguration or weak coding practices as opposed to security bugs in SQL Server itself, of which we had only a few in the last 10 years. In this purely demo-based session you will see samples of several real-life attacks, from mere reading up to disrupting service availability via various types of manual and automated SQL Injection, including a broadly unknown elevation of privileges attack for a non-sa account. If you have a database-server which is accessible by processes beyond your direct control or which even can be reached by some kind of frontend applications, and you are unsure what the possible security implications to watch out for, this session is meant for you. In diesem Artikel greife ich ein Thema auf, welches ich schon seit vielen Jahren immer wieder in Seminaren, bei Konferenzen und auch in Foren versuche zu vermitteln: Schema-Design. Mit Schema ist hierbei nicht das Datenbankschema mit seinem Tabellen-Design gemeint, sondern die „Datenbank-Objekt-Schemas“, die auch als Namensraum beschrieben werden. Seit dem Release von SQL Server 2005, nun immerhin über 10 Jahre her, liegt es mir besonders am Herzen, Nutzer darin zu schulen, wie man Schemas richtig verwendet. Eigentlich ist das auch gar nicht besonders schwierig. So, wie ein Entwickler/Architekt, sich für das ER-Diagramm und spätere Tabellendesign mit den Geschäftsprozessen auseinandersetzen muss, muss man sich für das Schema-Design mit den Datenbank-Zugriffs-Prozessen auseinandersetzen. Leider jedoch sehe ich auch heute noch jede Woche Datenbanken, die nur das „dbo“ Schema kennen. This article picks up a topic I have been teaching time and again in seminars, at conferences and in forums for many years: Schema-Design. Here, schema does not mean the database schema with its tabular design but rather the “database object schemas,” also described as Namespace. Since the release of SQL Server 2005, in fact more than 10 years ago, it is of particular importance to me to train users in correctly using schemas. As a matter of fact, it is not really that difficult. In the same way that a developer/architect has to deal with business processes for the ER-diagram and later tabular design, one has to deal with database access processes for the schema design. Unfortunately, however, I still see databases every week which only seem to know the “dbo” schema. Ich gebe zu, der Umfang an Informationen zu diesem Thema ist nicht so umfangreich wie zu den Dauerrennern „Indexing“ und „Performance“. Sicherheits-Härtung ist ein eher lästig empfundener Aufwand, und selten sind Entwickler in solchen Dingen geschult, um die wichtigen Entscheidungen gleich zur Design-Phase zu fällen. Mit diesem Blog-Post, der zugegeben lange überfällig ist, hoffe ich eine gute Referenz schaffen zu können. Denn, zur Entlastung aller Autodidakten, ausgerechnet die bekannte „AdventureWorks“-Datenbank ist alles andere als ein Vorbild in Sachen Schema-Design. Diese Datenbank ist prinzipiell geschaffen, um die neuen Features der SQL Server Versionen seit 2005 demonstrieren zu können, aber nicht immer werden die Konzepte dabei nach Best Practices entwickelt. Zumal das Konzept der Schema-User-Trennung damals noch recht neu war. I admit that the amount of information on this topic is not as extensive as on the regulars “Indexing” and “Performance.” Hardening Security is an effort perceived as rather annoying, and developers are rarely trained in such areas in order to make the important decisions right at the design stage. With this – admittedly long due – blog post I hope to provide a good reference. Because, to relieve all autodidacts, ironically, the well-known “AdventureWorks” database is anything but exemplary when it comes to schema-design. This database is generally supposed to demonstrate the new features of the SQL Server Versions since 2005, but the concepts are not always being developed according to best practices. Particularly as the concept of the Schema-User separation was a relatively new thing back then. Wer das alles nicht beachtete, hatte das Problem, dass er Konten von ehemaligen Entwicklern nicht vom Server löschen konnte, da ihnen ja noch Objekte zugeordnet waren, die dann am Ende fest in der Applikation verankert waren. Und deshalb hat das Security-Team für den SQL Server 2005 das Schema-Konzept komplett überarbeitet, mit dem Ziel, die Delegierung von Rechten zu vereinfachen. Das dbo-Schema ist im Wesentlichen ein Relikt aus der pre-2005 Welt, welches aus Rückwärts-Kompatibilitätsgründen noch da ist und gleichzeitig als Default-Schema bei der Namensauflösung verwendet wird (ebenfalls wie vorher). 1) All developers put all objects into the dbo-schema. The person not paying attention to any of it would face the problem that he could not delete accounts of former developers from the server as there were still objects assigned to them and that were in the end firmly anchored in the application. This is why the Security Team for SQL Server 2005 completely revised the schema concept, with the aim to facilitate the delegation of rights. The dbo-Schema is essentially a relic from the pre-2005 world, which still exists due to backward compatibility reasons, and which is at the same time used as default schema for name resolution (also like before). "Ein Schema ist ein eindeutiger Namensraum um die Trennung, Verwaltung und den Besitz von Datenbankobjekten zu erleichtern. Es entfernt die enge Kopplung von Datenbankobjekten und Eigentümern um die Sicherheitsverwaltung von Datenbankobjekten zu verbessern. Database-Objekt-Schemas bieten Funktionalitäten um Anwendungsobjekte innerhalb einer Datenbankumgebung zu kontrollieren und helfen sie zu sichern..."
Soweit zu dem hauptsächlichen Zweck. Natürlich kann man Schemas auch als Ordnungselement verwenden. Ich möchte sogar einladen dazu, das zu tun. Aber bitte erst an zweiter Stelle, wenn die Sicherheitsgrenzen feststehen. At this point, let me quote a member of the Security Team: “the intent with separating Schema from Users was to increase security – to allow more controlled delegation, etc. So much for the main purpose. Of course, one may also use schemas as organization element. I will even invite you to do that. But please only in second place, once the security borders are set. Auf den ersten Blick mag das schön „ordentlich“ aussehen. Wenn man jedoch genauer hinsieht und überlegt, wie man dort nun Berechtigungen vergeben soll, sieht es eher chaotisch aus. In allen Schemas gibt es Tabellen und entweder auch Sichten oder Prozeduren oder beides. Wenn man sich jetzt eine Frontend-Applikation dazudenkt, wo soll diese nun Berechtigungen erhalten? - Dass db_datareader, db_datawriter und eine „selbsterstellte „db_executor“ o.ä. nicht der Maßstab für diesen Artikel sind, ist sicherlich klar. - Das ist aber durchaus ein valider Ansatz für kleinere Datenbanken, mit wenigen Objekten, oder für Datenbanken, deren Objekte alle wirklich gleichermaßen verwendet werden sollen. At first sight, this might seem “neat and tidy.” However, once you look closer and start pondering how to assign authorizations, it looks rather chaotic. In all schemas, there are tables and either also views or procedures or both. Now if one imagines a frontend application in addition, where is it supposed to obtain permissions? - It is certainly clear that db_datareader, db_datawriter and a “self-created” “db_executor” or the like do not serve as a benchmark for this article. – Yet it is by all means a valid approach for smaller databases with few objects, or for databases whose objects are meant to be used truly equally. Für Sichten gibt es die SELECT- Berechtigung, bei Ad-Hoc-CRUD-Abfragen auch INSERT, UPDATE und DELETE. Für Prozeduren genügt die EXECUTE Berechtigung. Berechtigungen können auf Datenbank- Schema- und Objektebene vergeben werden. Und natürlich ist die Schema-Ebene die Ebene, die sich anbieten würde, wenn man verhindern möchte, dass man Berechtigungen auf alle Objekte ohne Einschränkung vergibt, aber auch, wenn man sich nicht mit Einzel-Objekt-Berechtigungen herumschlagen möchte. For views, there is the SELECT permission, in ad-hoc-CRUD queries there is also INSERT, UPDATE and DELETE. The EXECUTE permission suffices for all procedures. Permissions can be assigned on a database-schema and object level. And of course, the schema level is the level that would present itself if the intention is to grant authorizations to all objects without restriction, but also if one does not want to grapple with single-object permissions. In diesem Beispiel wird das SELECT-Recht auf alle Objekte in dem Schema „Knowledgebase“ vergeben. Angewandt auf unser AdventureWorks-Schema-Design, würde das bedeuten, dass wir SELECT-Rechte auf alle Schemas vergeben müssen, in denen Sichten oder Tabellen liegen – mit Ausnahme derer, wo neben Tabellen lediglich Prozeduren liegen, die auch wirklich alle benötigten Operationen auf die im selben Schema enthaltenen Tabellen durchführen – was hier auch nicht der Fall ist. Im Endeffekt wird man SELECT, INSERT, UPDATE, DELETE-Rechte auf alle Schemas vergeben müssen, zuzüglich einiger EXECUTE-Berechtigungen auf das dbo-, HumanResources-, Production- und Sales-Schema. Viel gewonnen hat man damit nicht. Ein Anwender kann damit auch an den Prozeduren vorbei auf den Tabellen arbeiten, wenn er eine Direkt-Verbindung zur Datenbank aufgebaut hat. Applied to our AdventureWorks schema design, this would imply that we have to grant SELECT rights to all schemas in which there are views or tables – with the exception of those where, besides tables, there are merely procedures that actually execute all required operations against the tables contained in the same schema – which is not the case here either. At the end of the day, one will have to grant SELECT, INSERT, UPDATE, DELETE rights to all schemas, and, in addition, a couple of EXECUTE permissions to the dbo-, HumanResources-, Production- and Sales-schema. This does not get us very far. A user can also work on the tables, past the procedures, after establishing a direct connection to the database. Wie sähe es aus, wenn man es aus der Sicherheitsperspektive richtig macht? Das ist nicht weiter schwer vorzustellen. SQL Server kennt ja so etwas wie “Objekt-Besitzerverkettung” (“Object-Ownership-Chaining”). Schemas haben einen Besitzer und sind Teil der Kette. Das heißt, solange die beteiligten Schemas den selben Besitzer haben, kann man in einem Schema, „Zugriffobjekte“ (Sichten, Prozeduren, Funktionen) halten, und in einem anderen Schema Objekte (Tabellen), auf die man keinen direkten Zugriff erlauben möchte. What would it look like if one does it correctly from a security-point-of-view? It is not that difficult to imagine. In fact, SQL Server knows a thing called “Object Ownership Chaining.” Schemas have an owner and are part of the chain. That means, as long as the schemas involved have the same owner, one can keep “access-object” (views, procedures, functions) in one schema, and, in another schema, objects (tables) to which one does not want to allow direct access. Das Prinzip hatte ich 2009 auf dem PASS Summit in Seattle im Vortrag „Securing SQL Server from Inside-Attacks“ „Schema-Ownership-Chaining“ getauft. Man sieht hier in der (leicht modifizierten) Slide, dass ein User keinen direkten Zugriff auf die Tabellen in dem Schema „Data“ hat, sondern nur über Sichten in dem Schema „Access“ (=„Zugriff“ – daher „Zugriffsschema“). Das funktioniert, weil die Schemas und die enthaltenen Objekte denselben Besitzer haben. Hier „dbo“. In the (slightly modified) slide above, one can see that a user does not have direct access to the tables in the schema “Data” but only via views in the schema “Access” (hence “Access-Schema”). This works because the schemas and the contained objects have the same owner – “dbo” in this case. Aus dieser Grafik geht noch besser hervor, dass in dem Schema „App1“ keine Tabellen liegen, sondern nur Zugriffscode in Form von Prozeduren, ggf. Sichten. Daher genügt ein EXECUTE-Recht auf dieses Schema, und was immer die Prozeduren durchführen (SELECT, INSERT, UPDATE, DELETE), erfordert keine weiteren Rechte – schon gar nicht auf den Tabellen, hier im Schema „Sales“, selber. Und noch ein zweiter Ansatz wird hier ersichtlich: Das Denken an „Prozesse“ bzw. hier Applikationen. In vielen Datenbanken muss eine Applikation nicht wirklich auf alle Tabellen zugreifen. Spätestens sobald mehrere Applikationen mit einer Datenbank arbeiten, wird ersichtlich, dass das „Ordnungs-Konzept“ einem im Wege steht. Idealerweise erschafft man also für jede Applikation ein eigenes Schema, das genau die Prozeduren enthält, die diese verwenden soll. Für Ad-Hoc Zugriffe, die leider oft für Code-generatoren benötigt werden, kann man das auch mit Sichten machen. Und es hindert einen niemand daran, ein „gemeinsames Schema“ zu erschaffen, in dem Code (Prozeduren und Sichten) liegt, der von beiden verwendet wird. Im Endeffekt kommt man so mit wirklich einer Handvoll Rechten aus, und genügt dennoch den Prinzipien „Least Privilege“ (Geringstmögliche Rechte) sowie „Separation of Duties“ (Funktionstrennung). A second approach becomes evident here: Considering “processes” or, in this case, applications. In many databases, an application must not really access all tables. At the latest when several applications are working with one database it becomes apparent that the “order-concept” represents an obstacle. Ideally, then, for each application one schema is created that contains exactly those procedures the former is supposed to use. For ad-hoc-accesses, unfortunately often needed for code generators, it is also possible to do this with views. In fact, no one keeps you from creating a “common schema” in which there is the code (procedures and views) that is used by both. Achtung: die Besitzverkettung kann auf allen Ebenen, d.h. Schema, Prozedur, Sicht oder Tabelle durchbrochen werden. Das passiert auch, wenn man den Besitzer einer Tabelle ändert, wie im Folgenden dargestellt. Attention: the ownership-chains can be broken on all levels, i.e. schema, procedure, view or table. This also occurs when the owner changes a table, as demonstrated below. An dieser Stelle ist die Besitzverkettung unterbrochen. Und nicht nur das: auch sämtliche Schema-Berechtigungen werden dadurch zurückgesetzt! At this point, the ownership chain is broken. Not only that: also, as a result all schema permissions are reset! Now that the concept is clear, let’s give the AdventureWorks-database a shot. Die Sichten liegen nicht mehr zusammen mit Tabellen, damit ein SELECT-Recht auch wirklich nur Sichten betrifft. Neu ist das Schema „WebShop“, was beispielhaft für eine Applikation gedacht ist, die eben alle Prozeduren aufrufen und Sichten verwenden darf, die dafür programmiert worden sind. Das dbo-Schema ist jetzt leer und bestimmte Objekte, Log-Tabellen z.B. liegen im Admin-Schema. Man kann diese auch im dbo-Schema belassen, aber man muss bedenken, dass dieses immer als Default-Schema bei der Namesauflösung verwendet wird. The views are not together with tables anymore so that a SELECT right is sure to concern views only. What is new is the schema “WebShop,” which is meant exemplary for an application that is permitted to call all procedures and use views programmed for this purpose. The dbo-Schema is now empty, and particular objects, e.g. log-tables are in the Admin-Schema. It is also possible to leave them in the dbo-Schema, but it is important to consider that this is always used as a default-schema for name resolution. In manchen Szenarien kann eine durchbrochene Besitzverkettung auch gewollt sein. Um dennoch bestimmten Modulen Zugriff auf Daten im Zielschema zu gewähren, ohne das Zielschema selber mit Berechtigungen freizugeben, kann man mit der „EXECUTE AS-Klausel“ arbeiten. Im Folgenden einige Ansätze, wie man bei der Entscheidung für Schema-Design vorgehen kann. In the following, I will present a few approaches to the decision-making for schema-design. The ideal measure would be a structure according to process or application (also known as “role” among security experts). Anstelle “dbo” empfehle ich einen expliziten “User without Login“ anzulegen und als dedizierten Schema-Besitzer zu verwenden. In place of „dbo,” I recommend setting up an explicit “User without Login” and using it as dedicated schema-owner. An dieser Stelle vielen Dank fürs Lesen. Der erste Schritt ist damit getan: sich mit der Thematik Schema-Design überhaupt auseinanderzusetzen. Ich würde mir wünschen, dass das auch zu einem Umdenken führt, und ich mehr durchdachte Schema-Verwendungen sehe. Und dazu kann auch eine sinnvolle logische Aufteilung aus Ordnungszwecken gehören – idealerweise in Kombination mit einem Zugriffsschema. Aber alles ist besser als sämtliche Programme direkt in C:\Programme\ abzulegen – Unterordner sind dort ja auch Usus. First of all, thank you very much for reading. The first step has thus been taken: to generally engage with the issue of Schema-Design. It is my hope that this also leads to a rethinking and that I am going to see more well-designed schema-uses. And a practical, logical partitioning for the purpose of order can be part of this – ideally combined with an access-schema. But anything is better than saving all programs directly in C:\Program Files\ – there, subfolders are also common practice. Special thanks to Jack Richins and Steven Gott from the Security Team in Redmond for reminding me of some aspects to add and allowing me to quote them in my article. Dieses Jahr findet vom 23.-25. Februar die 3. SQLKonferenz in Darmstadt statt. Zum einen ist meine Firma, Sarpedon Quality Lab®, erstmalig Silber-Sponsor der Konferenz. Damit unterstütze ich die PASS Deutschland e.V., der deutschen SQL Server Community, der ich seit vielen Jahren sehr verbunden bin, und in welcher ich auch seit einigen Jahren als einer der 3 Regionalgruppenverantwortlicher der Region Rheinland engagiert bin. This year, from 23 to 25 February, the 3rd ”SQLKonferenz” takes place in Darmstadt. For one, my company, Sarpedon Quality Lab®, is for the first time Silver Sponsor of the conference. In this way, I am supporting PASS Deutschland e.V., the German SQL Server Community, with which I have been closely connected for many years, and in which I have also been involved as one of the 3 regional chapter leaders of the Rheinland Region for a couple of years. Joachim Hammer, der Leiter der Security für die SQL Engines bei Microsoft in Redmond (also SQL Server und auch der In-Memory Engine XTP, Azure, APS,…) wird mit mir zusammen die neuen Sicherheitsfeatures des bald erscheinenden SQL Server 2016 vorstellen! Das ist eine große Ehre für mich. Ich freue mich, dass ich ihn dafür gewinnen konnte, unsere Konferenz in Deutschland zu besuchen und sich in einer gemeinsamen Session dem kritischen deutschen Publikum zu stellen. Joachim Hammer, the Head of Security for the SQL Engines at Microsoft in Redmond (i.e. SQ Server as well as the In-Memory Engine XTP, Azure, APS, …) will be introducing with me the new security features of SQL Server 2016, which will be released soon! This is a great honor for me. I am happy that I was able to convince him to attend our conference in Germany and to be available to the tough German audience in a joint session. Joachim Hammer, Leiter des Security-Teams für die relationalen SQL Engines in Redmond, und Andreas Wolter, Microsoft Certified Solutions Master der Data Platform, geben in dieser Session Einblicke in die wichtigsten Sicherheits-Features von SQL Server 2016. Denn dieses Release wird komplett neue Features einführen, die auf verschiedenen Ebenen der Datensicherheit dienen. Die Top 3: Dynamic Data Masking, Row Level Security und das Highlight: Always Encrypted. In dieser Session gibt es technische Einblicke und Demos, aber auch Hinweise auf Sicherheits-Fallstricke sowie die einmalige Möglichkeit, Fragen zu Implementierungsdetails und dem Entwicklungsprozess direkt an den Entwicklungschef zu stellen. Die Session soll Administratoren als auch Entwickler bei der Entscheidungsfindung für die richtige Technologie unterstützen. Der Vortrag wird in englischer Sprache stattfinden, Fragen können aber problemlos live übersetzt werden. Nutzen Sie diese einmalige Möglichkeit den Program Manager der Security Teams direkt Fragen stellen zu können. In this session, Joachim Hammer, Program Manager of the Security-Team for the relational SQL Engines in Redmond, and Andreas Wolter, Microsoft Certified Solutions Master for the Data Platform, will give insights into the most important security features of SQL Server 2016. In fact, this release will introduce completely new features that serve data security on different levels. The top 3 features are: Dynamic Data Masking, Row Level Security, and, as a highlight: Always Encrypted. The session will provide technical insights and demos but also hints to security traps as well as the unique opportunity to address questions regarding implementation details and the development process directly to the head of development. Wer es irgendwie einrichten kann: lasst es Euch nicht entgehen, Fragen direkt an den Program Manager für SQL Security zu stellen! Time of the presentation: 24 Feb., 1:30-2:30 pm. For those who can make it work somehow: don’t miss out on the chance to pose questions directly to the Program Manager for SQL Security! Das Thema In-Memory wird dieses Jahr übrigens von meinem geschätzten Kollegen Guido Jacobs, ebenfalls Microsoft, übernommen werden. In seinem Vortrag, der sich direkt meinem anschließt, geht es um „Operational Analytics“, das der Begriff für die im SQL Server 2016 mögliche Kombination aus In-Memory OLTP mit ColumnStore Technologie ist. Mein Tipp: es lohnt sich, sich damit nun zu befassen. Die XTP-Engine ist im SQL Server 2016 wirklich wesentlich ausgereifter und für viel mehr Workloads und Datenbankdesigns verwendbar. This year, the topic In-Memory will be taken over by my distinguished colleague Guido Jacobs, also from Microsoft. His presentation, which will follow right after mine, is on “Operational Analytics:” the term for the combination of In-Memory OLTP with ColumnStore Technology that is possible in SQL Server 2016. My advice: it is worth dealing with it now. The XTP-Engine is far more sophisticated in SQL Server 2016 and applicable for many more workloads and database designs. Ich freue mich auf interessante Gespräche. Und diesmal wird es leichter sein, mich zu finden: wenn ich nicht gerade in einem Vortrag bin, sollte ich am Stand von Sarpedon Quality Lab® zu finden sein :-). I am looking forward to interesting discussions. This time, I will be easier to find: unless I am sitting in on a presentation, or presenting myself, you should find me at the Sarpedon Quality Lab® booth :-).